19th century Georgian pair of cut glass salts with draped swag design. 19th century Georgian pair of cut glass salts with draped swag design, star cut bases, and scalloped edges, standing on pedestal feet. Size 2 5/8 wide by 2 1/8 inches high. A very elegant pair in very good condition. 19th century pair of cut glass dishes. 19th century pair of heavily and beautifully cut glass dishes with sharp edges, star cut bases, and intricate cut borders. One appears to be perfect, while the other has a couple of chips to one inner edge-very difficult to see without magnification. Size 6.5 inches diameter, and 1.5 inches high. 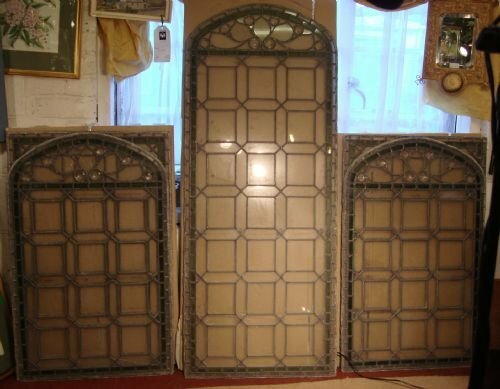 Lovely antique set of 5 leaded stained glass windows including three arched and two rectangular windows. 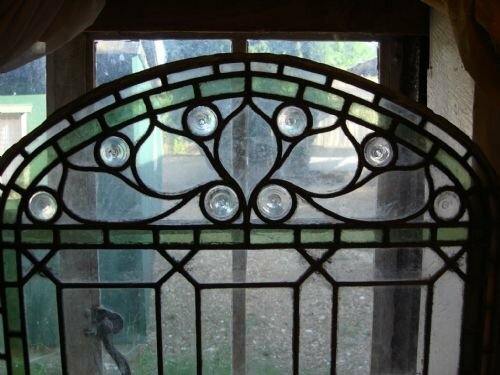 Turn of 19th/20th century set of 5 lovely leaded stained glass windows made with clear and green glass and including hand spun rondels. 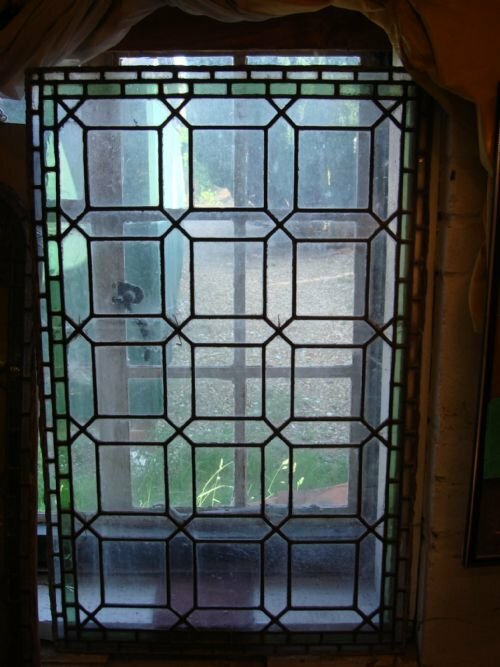 This set of unframed windows were removed from a building in the southeast of England, and are ready to be framed into windows in a house restoration, new build or extension. They would also make a great hinged or fixed room divider or hanging. The possibilities are endless. The set comprises one large arched top window, a pair of smaller arched top windows, and a pair of rectangular windows, all matching (the rectangular pair is shown resting beneath each small arched top one in the first photo). The design is mainly octagonal, with borders of clear and green rectangular pieces. The arched top windows have a tear dropped fan design including eight lovely hand spun rondels in each, which catch the light beautifully. 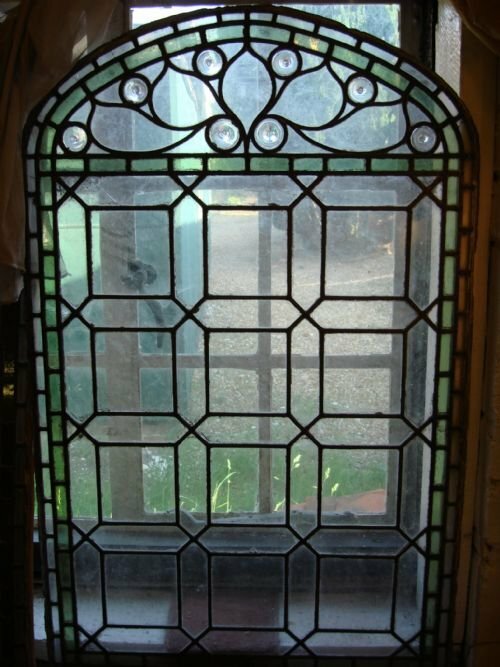 These windows can be combined to make one magnificent window on a building, or split to use in pairs or individually. 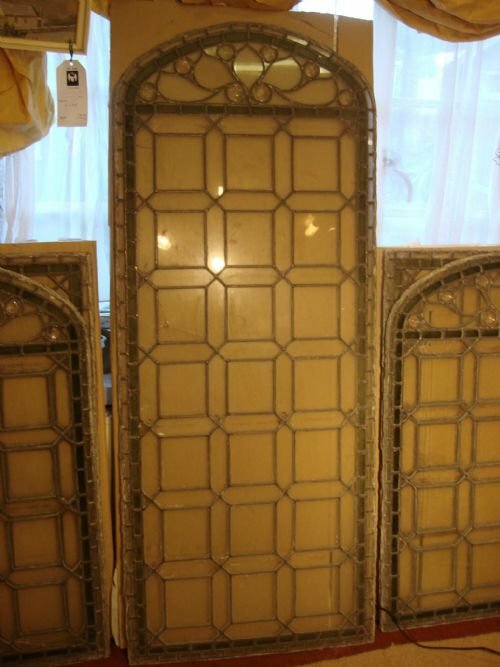 Size-Large arched top window 23.75 inches wide by 53.25 inches high. Both the arched pair and the rectangular pair all measure 24 inches wide by 37.75 inches high each. As they line up exactly, the smaller arched windows can be mounted on top of the rectangular ones to create taller arched top windows if desired. Condition is very good overall for such glass. There are a few expected cracks in the thin rectangles around the borders, and a handful on some inside portions of glass among the five windows. They can be restored or repaired as desired. The windows can be repacked for transport in the boxes they are leaning against for safe support for display. Simple and elegant windows that create a wonderful opportunity for design purposes. Please ask if additional photos or information is desired. Just reduced for a quick sale. A great value! Will also consider splitting set, if less than 5 windows are required. Lalique 1930's pre-war two piece bowl and cover with interesting and unusual bubble pattern, signed to the base with engraved mark R. Lalique, France, for Rene Lalique, from the most collectable period when he was still alive. Lalique glass is known as the essence of Art Deco design, and is highly collectable. Size 7.75 inches wide by 3.25 inches deep. A fine example of Lalique glass, with very crisp decoration, in excellent condition. A lovely famous maker oviform vase having stunning fluted cut glass decoration, made by ST. LOUIS CRYSTAL, world famous French glass house. St. Louis crystal French oviform fluted vase , with alternating deep cut glass bands that echo and enhance the bulbous form. A very heavy and fine quality vase to use or display, in very good condition, and having etched makers mark to base. St. Louis Cristallerie is the oldest glass house in France, having been established in 1586. They are known for producing glass of the highest quality, and for their precision cutting. Size-8.25 inches high, by 6.5 inches wide. Stunning 19th century Victorian lustre with original crystal drops in very good condition. 19th century stunning Victorian large opaline glass lustre having raised hand painted enamel foliate decoration with gilt embellishment, and with the original unusual and beautifully cut long crystal drops. The 10 long drops are prism cut with cut crystal balls to the bottom. They catch the light beautifully. Size-14.5 inches high by 6.5 inches diameter. Drop lustres are 9 inches long each (not including hook). A superb example of a Victorian lustre, in very good condition, and guaranteed to impress. It is rare to find a survivor from the 19th century in this condition. 20th century Daum fine French crystal pate de verre signed sculpture of bird. 20th century Daum fine French crystal pate de verre sculpture or figure of a bird with coloured head and plummage. This figure is retired,and is in excellent condition. It is signed Daum, France. Size 9.5 inches long by 3.5 inches wide. The pate de verre process is an ancient glass process which was revived by the French in the 19th century. It involves making a paste of glass particles mixed with enamel or paint, and applying that to the glass mould and firing it. It creates a lovely slightly opaque coloured effect, which is striking next to the plain crystal. This is a lovely sculpture, which will look beautiful to display, and would make an excellent gift. 20th century Daum fine French crystal sculpture of Madonna and child, or mother and child. 20th century Daum fine French crystal sculpture of Madonna and child or mother and child. This figure is retired by Daum, is in excellent condition, and signed to base, Daum France. Size 10 inches high by 3.25 inches wide by 3.25 inches deep. A lovely and beautifully crafted figure. Edwardian period lovely pair of tall fluted antique cranberry glass vases. The bulbous bases have a polished pontil, and above the beautifully fluted sides the tops have ruffled frilled rims. They are 14.5 inches high by 6.5 inches wide at the widest points, and are both in very good condition. These are unusual, large and collectable antique cranberry glass vases, and priced very well for a pair. Art Deco period cobalt blue cut glass scent bottle with etched flowers to stopper centre. 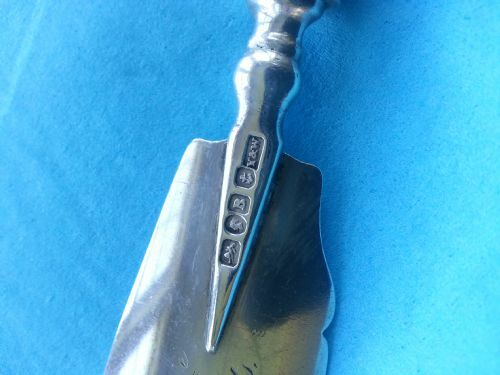 Maker is unknown. Gorgeous large scent bottle with many cut and bevelled angles, and large matching stopper, for an overall striking effect. In very good condition. There is a chip to one wide corner which could be ground, and the bottom of the stopper appears to perhaps have had a dauber rod at some point. Size 7 inches wide by 6.5 inches high. A lovely scent bottle to collect or display, in very good condition.